The spectacular, century-old wall map below exists in myriad prints and is a perfect example of pure booster cartography. Danish artist Francis Lawrence drew this meticulous rendering of each and every building in the booming city. He spent 15 months pounding the mostly unpaved streets of L.A. to make sure his drawing was accurate, and he insisted that the map be large—six feet by three feet to be exact—so all the details would be visible. 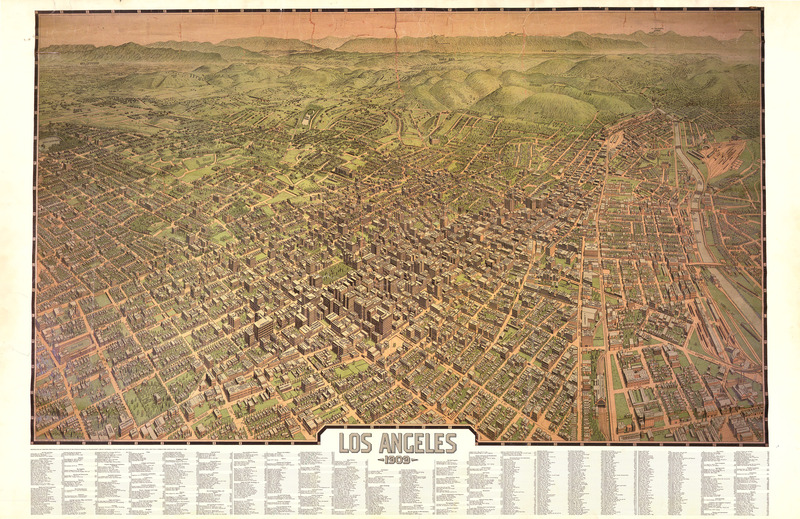 The scope of this map is unusually large, ranging from the edges of East Los Angeles to the fledgling city of Hollywood, which peeks up from the foot of the mountains. This enticing image depicts the basin as a land of serenity, but it doesn’t tell the full story of what was happening in this city of tarnished angels. 1909 turned out to be an action-packed year for local history. President Taft visited, the Buena Vista Bridge was dedicated as the city’s first reinforced concrete structure, and the harbor was annexed. In less wholesome news, though, 1909 was also the time of one of L.A.’s most infamously corrupt leaders—mayor Arthur Cyprian Harper. Harper was the son of a wealthy Mississippian who made his money in hardware when he came to Los Angeles after the Civil War. In 1906 Harper—despite his predilection for drinking, gambling, and frequenting the many houses of ill repute downtown—made the jump from bank teller to mayor, the most powerful position in the city. Before long, Harper was neck-deep in graft, sketchy dealings, and inappropriate political appointments; his cronies sought to privatize the L.A. riverbed and pump up shares in a sugar company stock speculation scam. Los Angeles at that time was the sort of wide-open town where anything goes, and at first it seemed like Harper was thriving. The Los Angeles Herald spoke highly of the new mayor, describing his first year as “a period which is hailed by citizens of all political faiths as the most satisfactory twelve months in Los Angeles history.” But the truth soon came out. With Harper at the helm, the city was basically controlled by Big Oil and Big Railroad, two industries whose money oozed into the basin and the mayor’s pockets. The situation was exacerbated by the $25 million Harper planned to personally distribute for the building of the aqueduct. When the Herald caught wind of it, they went to work printing a string of articles entitled “Is Vice Protected in Los Angeles?” The series fired up public opinion to the point that over 200 prominent citizens got on board for the very first recall movement in American history—and they rounded up 25,000 signatures from fed-up Angelenos in support. 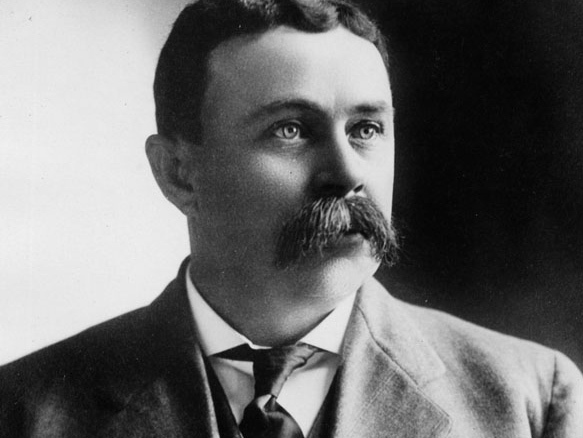 Harper was described as everything from “his dishonor” to “thief, gambler and the swine.” The coup de grâce, though, was a stinging editorial suggesting that those who put up “Mayor Harper is Good Enough for Us” signs should “retreat to the hills and start up a new city which they may run wide open in a manner to suit their tastes.” The prominent citizens voted 203-6 to “throw the bum out,” and the rest of the city did just that.